I know it's not very clear- I was drawing in pencil tonight- I usually do these in black ink. My sister likes the Virginia Knotweed and I like Lizard's Tail, the plant on the left. I should say I don't draw these out of my mind's eye- I'm usually using a book to guide me in what they look like, or sometimes I just copy pictures I see. 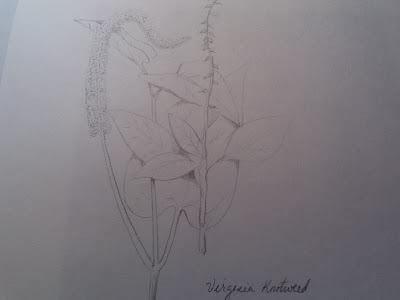 Virginia Knotweed was my neighbor growing up. Lovely old woman, she'd was short, only about four feet or so, and she liked to hang out in moist thickets.